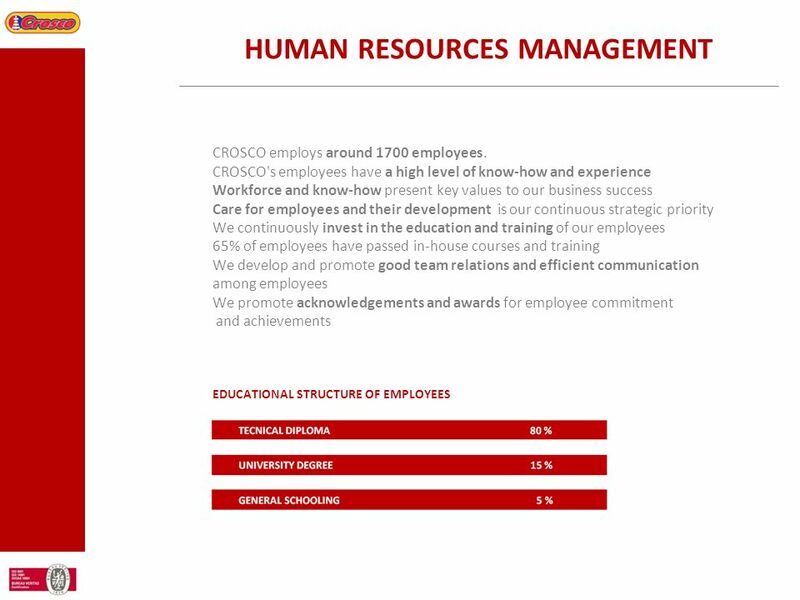 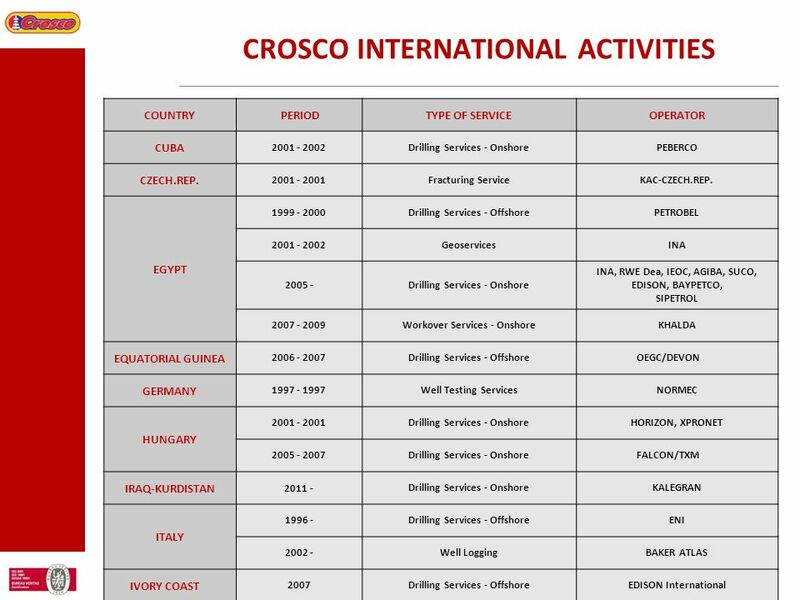 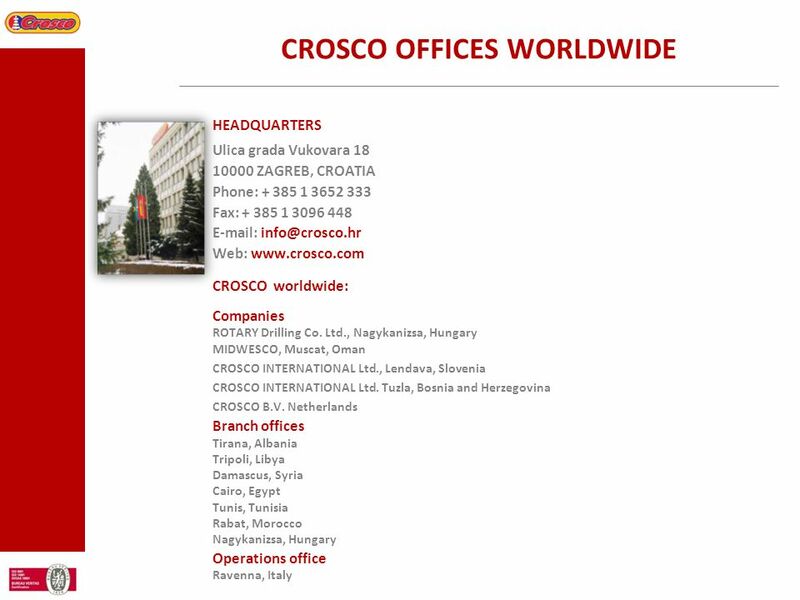 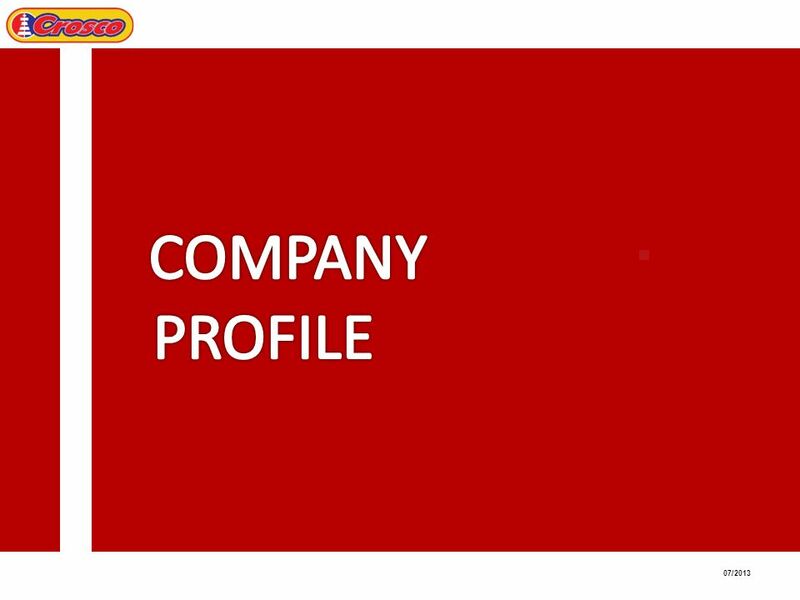 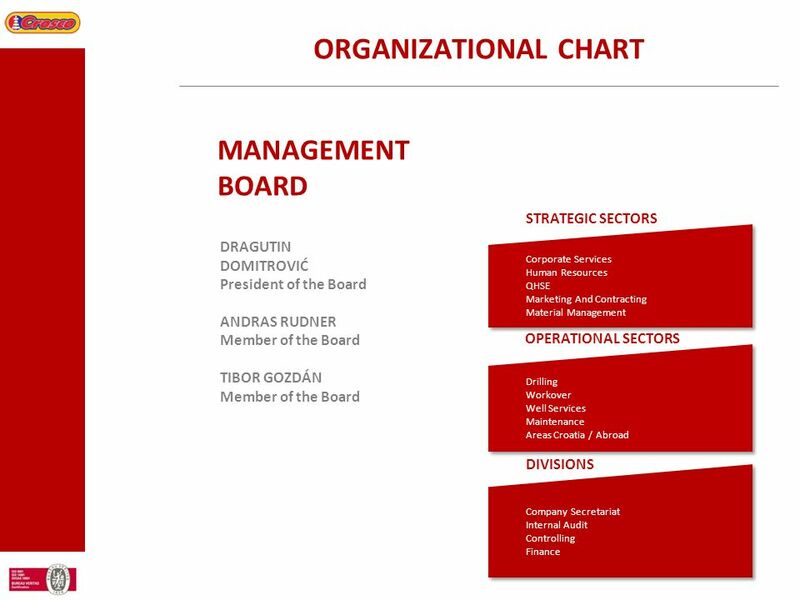 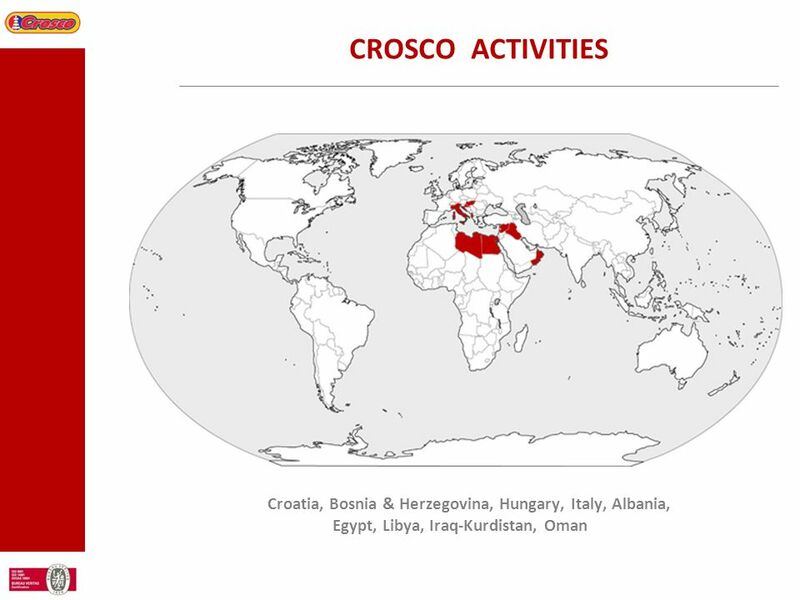 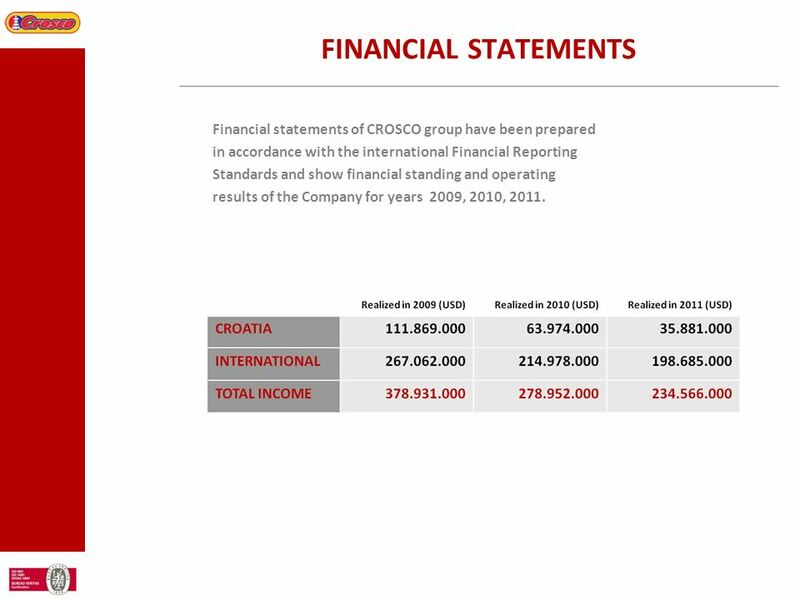 8 FINANCIAL STATEMENTS Financial statements of CROSCO group have been prepared in accordance with the international Financial Reporting Standards and show financial standing and operating results of the Company for years 2009, 2010, 2011. 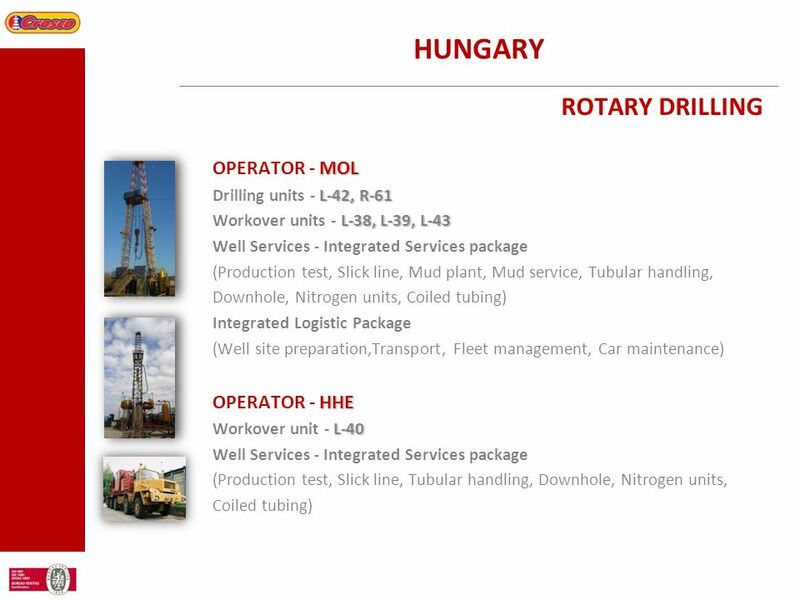 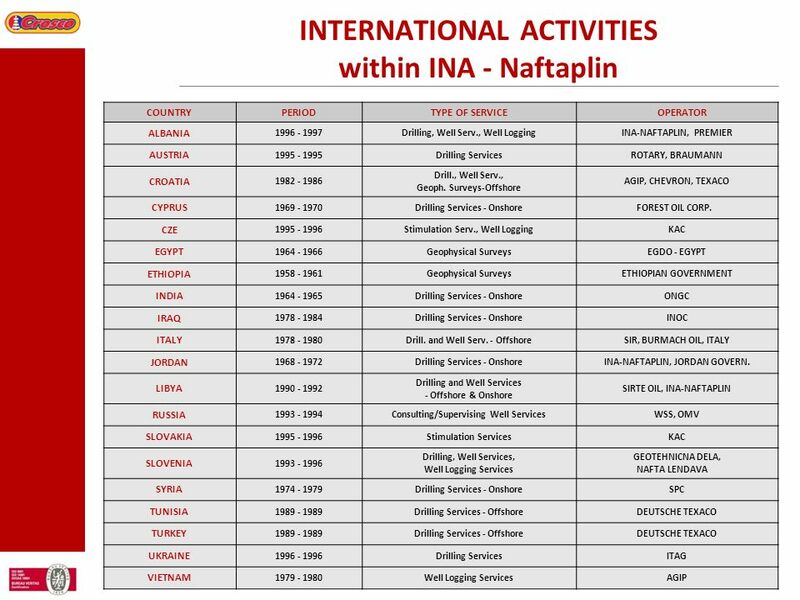 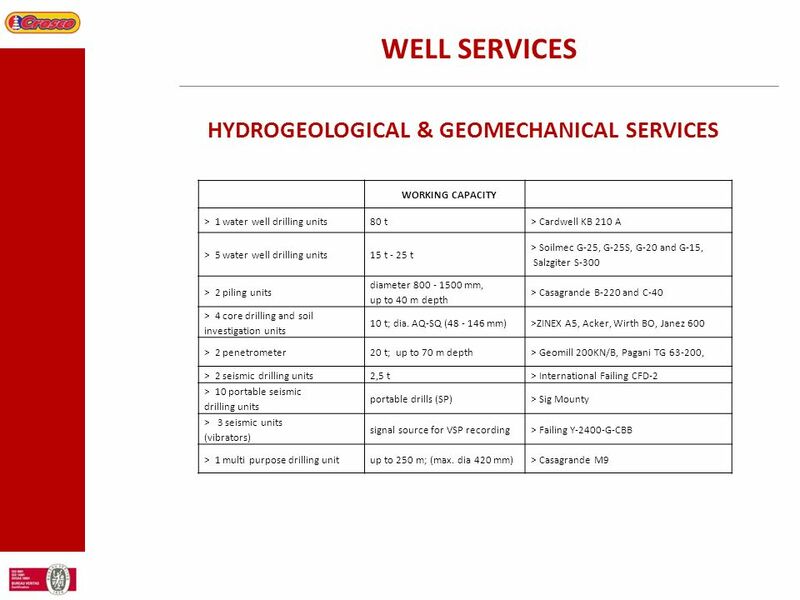 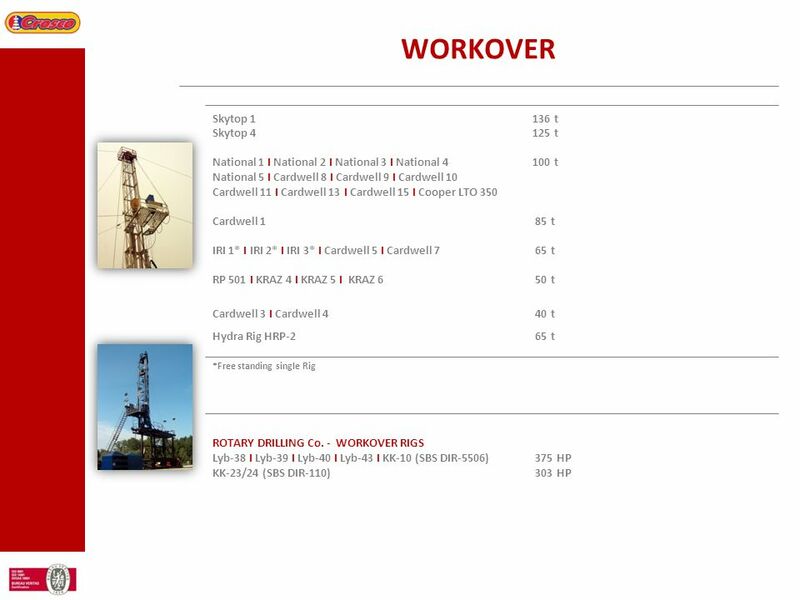 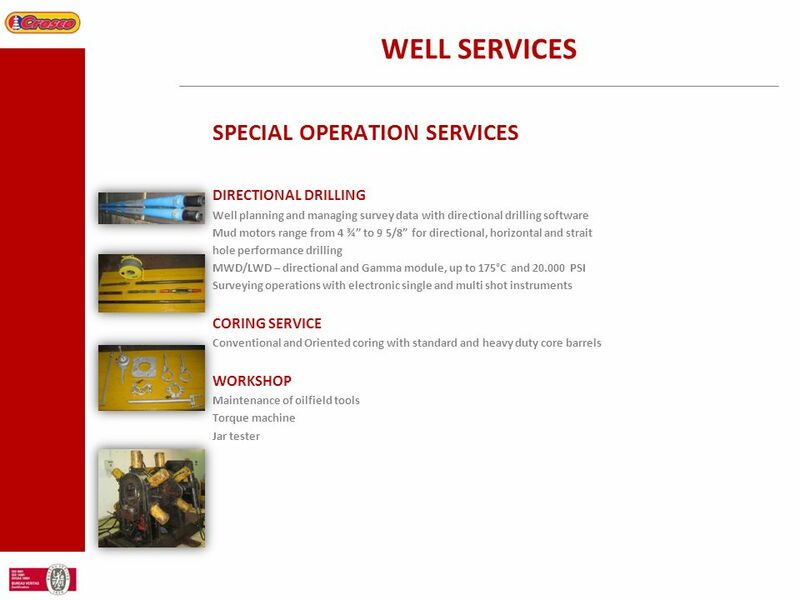 Engineering, maintenance and preventive maintenance is provided for drilling and workover rigs both onshore and offshore, well services equipment, process machinery equipment, electric and electronic equipment, oil tools and refineries. 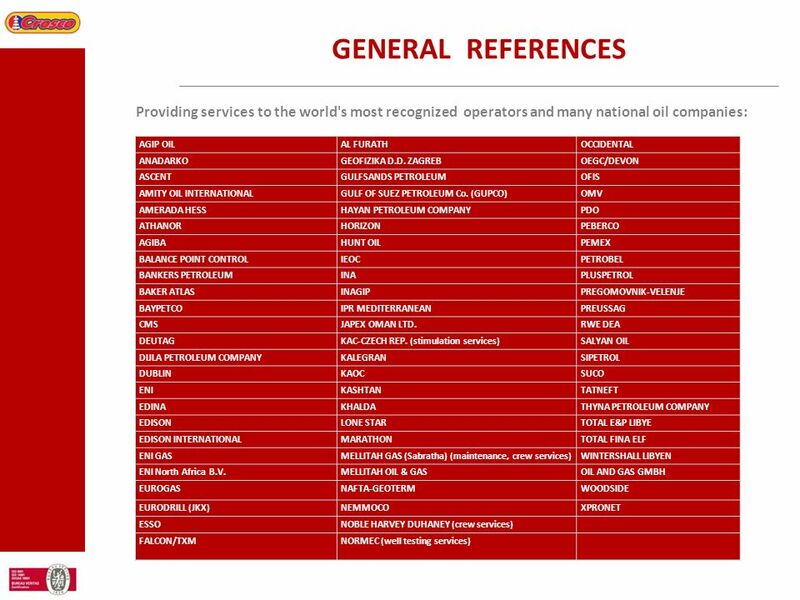 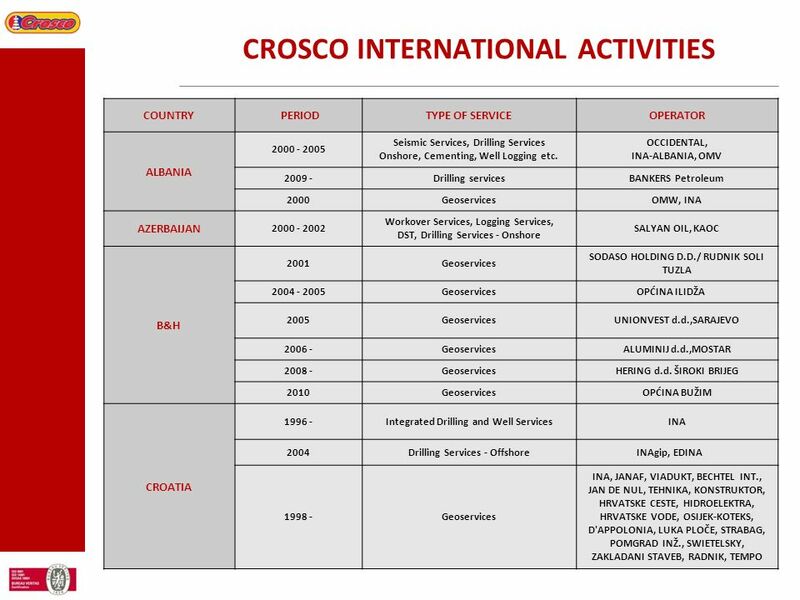 These services were developed for the requirements of CROSCO and other INA companies and are now available to clients outside of CROSCO. 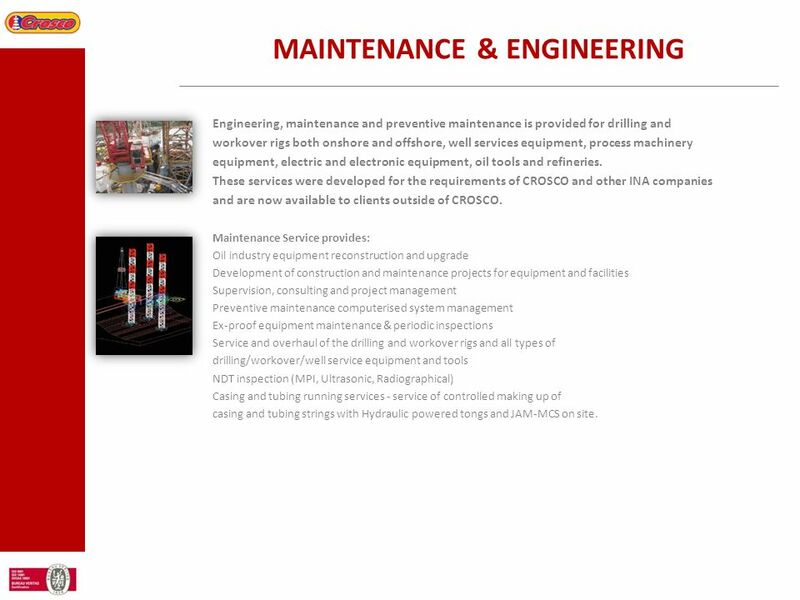 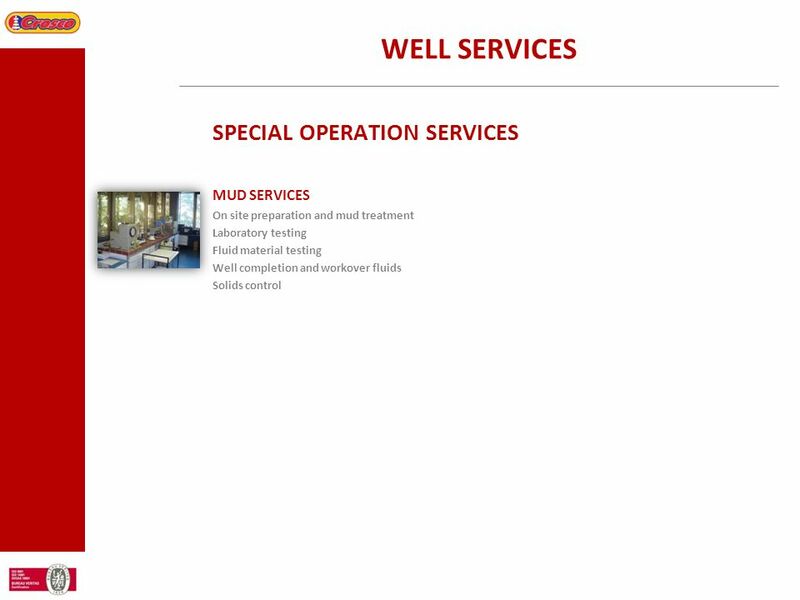 Maintenance Service provides: Oil industry equipment reconstruction and upgrade Development of construction and maintenance projects for equipment and facilities Supervision, consulting and project management Preventive maintenance computerised system management Ex-proof equipment maintenance & periodic inspections Service and overhaul of the drilling and workover rigs and all types of drilling/workover/well service equipment and tools NDT inspection (MPI, Ultrasonic, Radiographical) Casing and tubing running services - service of controlled making up of casing and tubing strings with Hydraulic powered tongs and JAM-MCS on site. 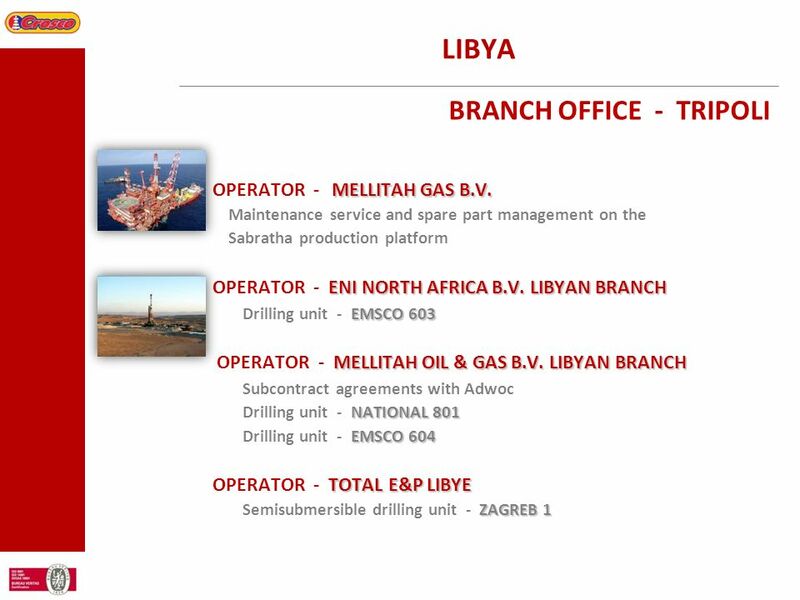 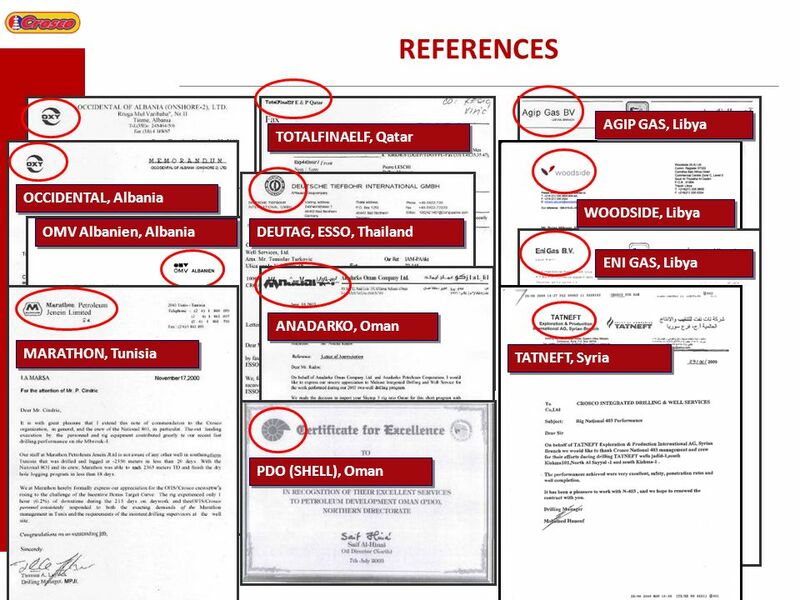 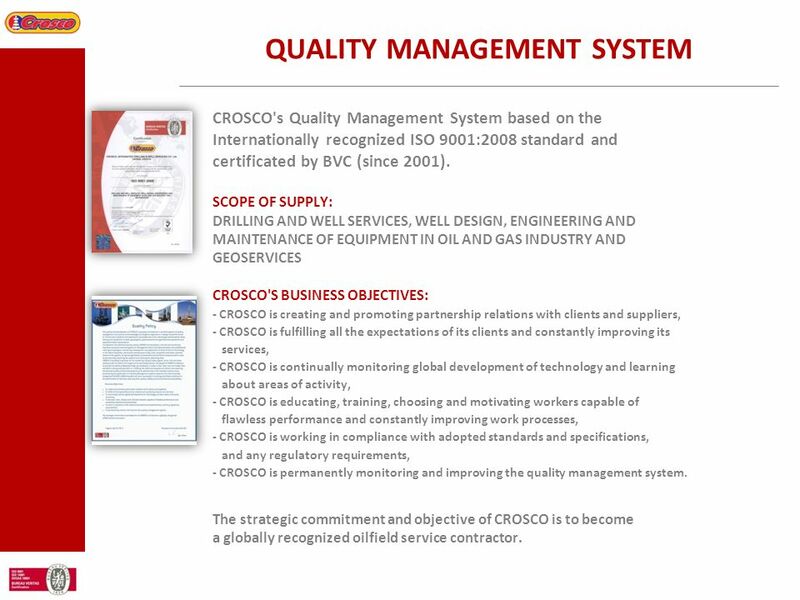 25 LIBYA OPERATOR - MELLITAH GAS B.V.
CROSCO's Quality Management System based on the Internationally recognized ISO 9001:2008 standard and certificated by BVC (since 2001). 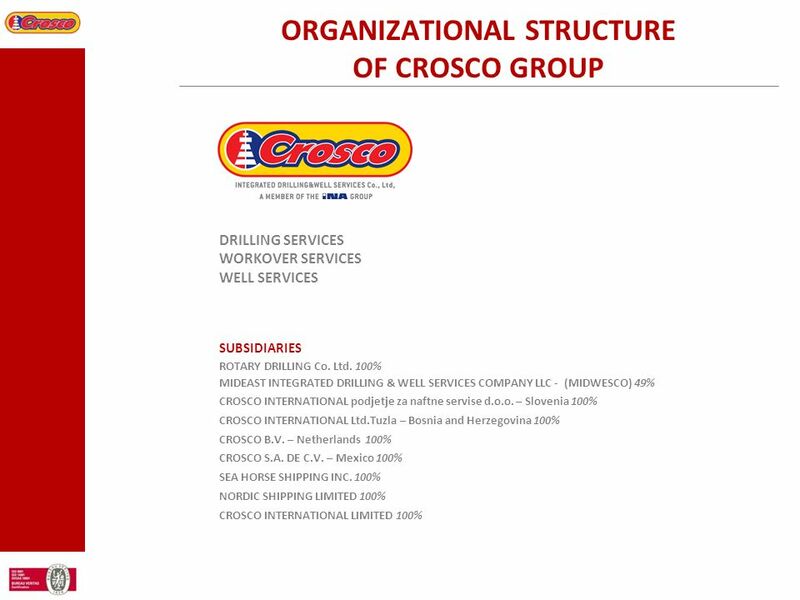 SCOPE OF SUPPLY: DRILLING AND WELL SERVICES, WELL DESIGN, ENGINEERING AND MAINTENANCE OF EQUIPMENT IN OIL AND GAS INDUSTRY AND GEOSERVICES CROSCO'S BUSINESS OBJECTIVES: - CROSCO is creating and promoting partnership relations with clients and suppliers, - CROSCO is fulfilling all the expectations of its clients and constantly improving its services, - CROSCO is continually monitoring global development of technology and learning about areas of activity, - CROSCO is educating, training, choosing and motivating workers capable of flawless performance and constantly improving work processes, - CROSCO is working in compliance with adopted standards and specifications, and any regulatory requirements, - CROSCO is permanently monitoring and improving the quality management system. 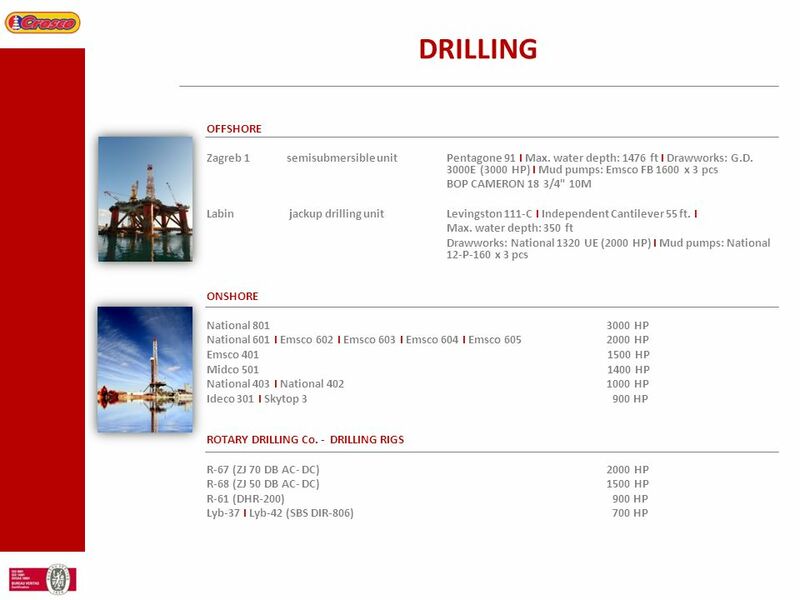 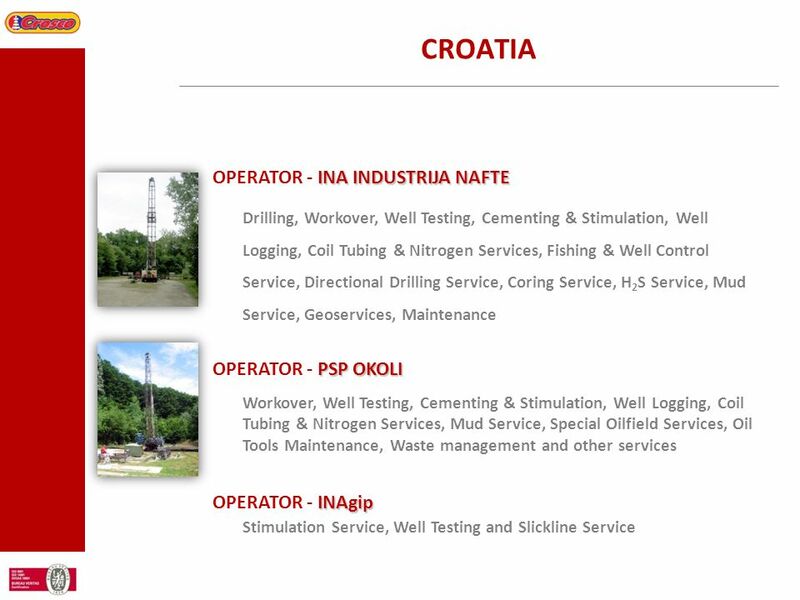 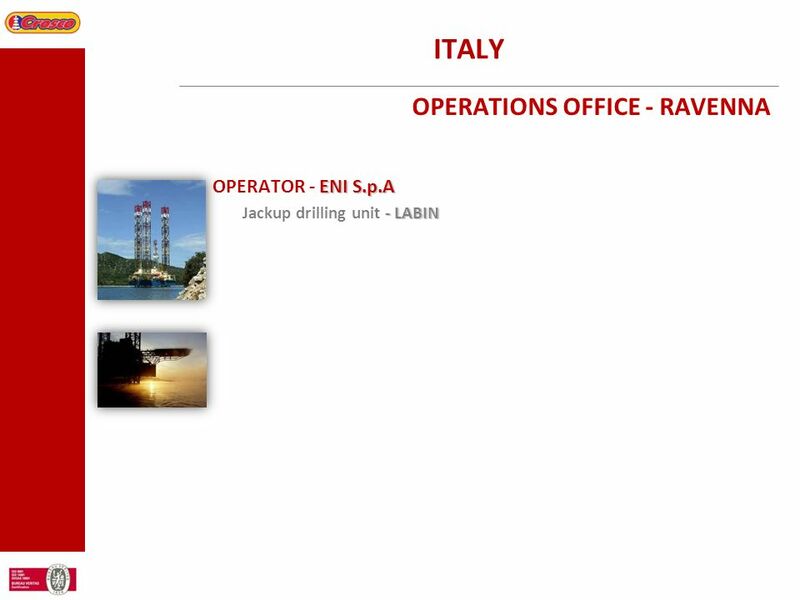 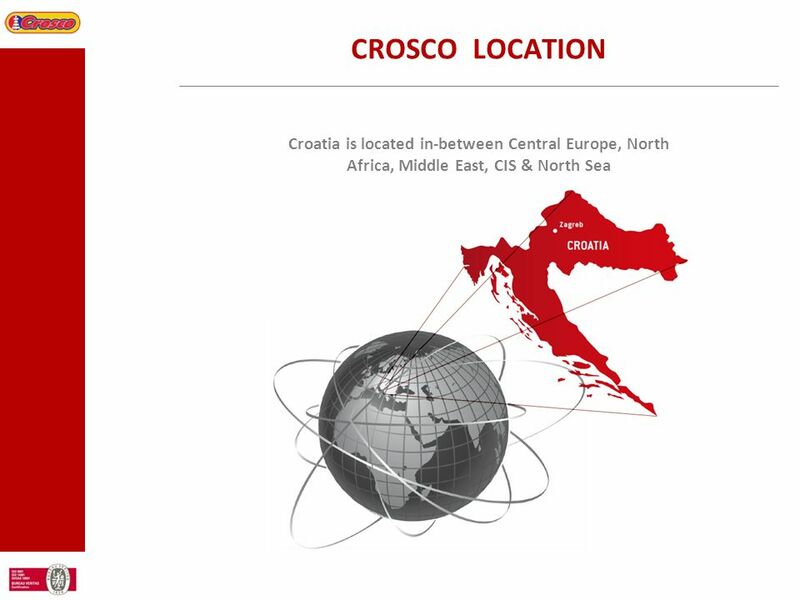 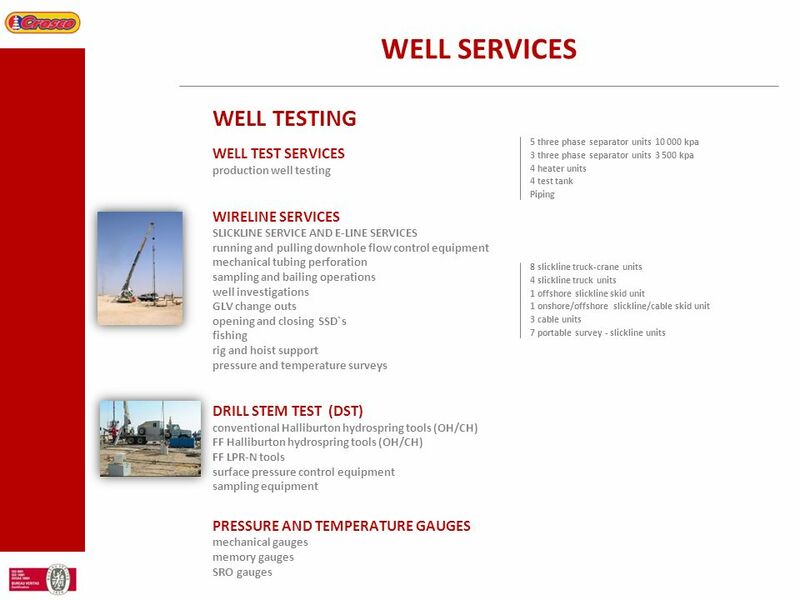 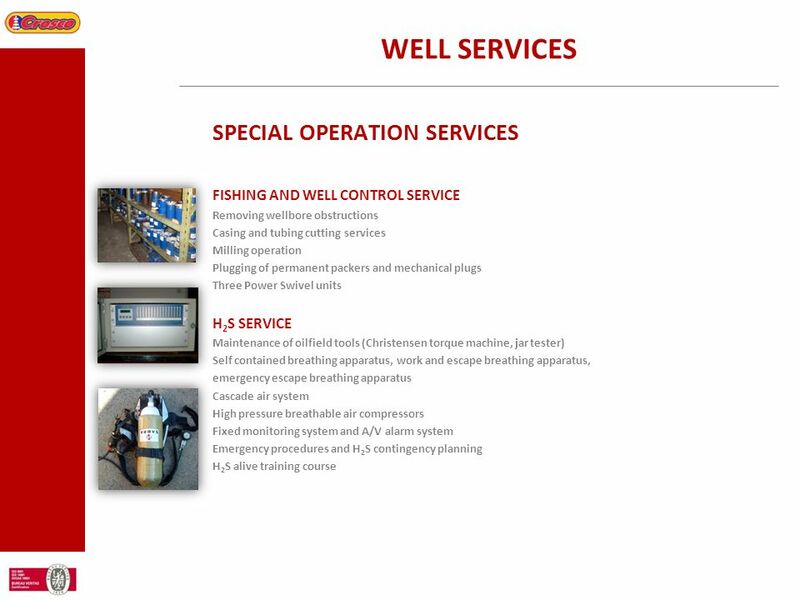 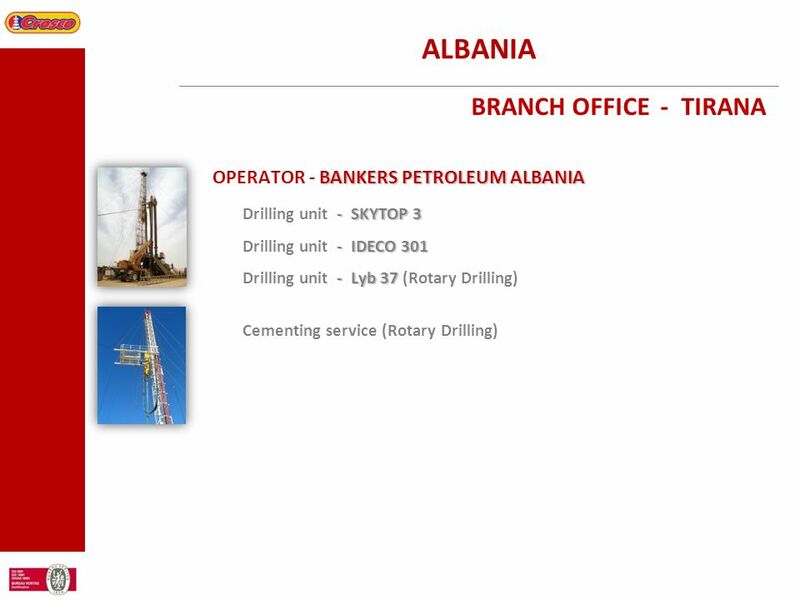 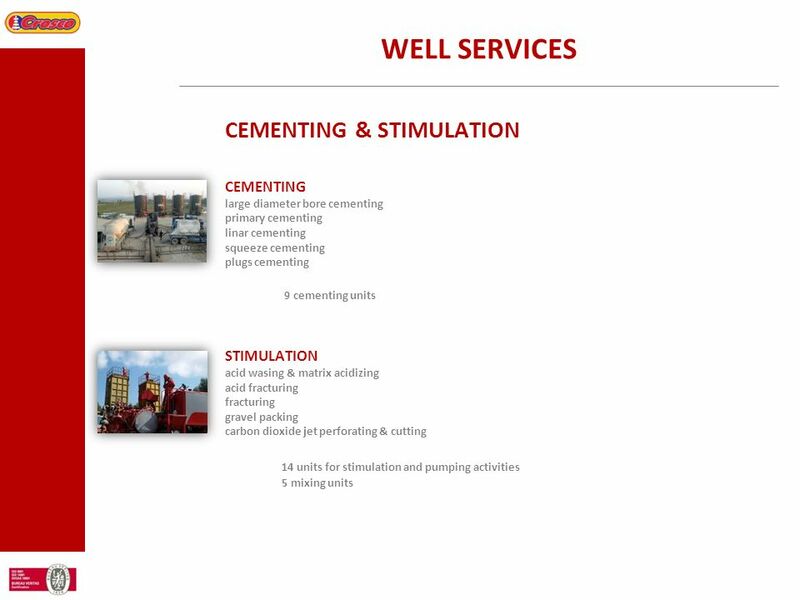 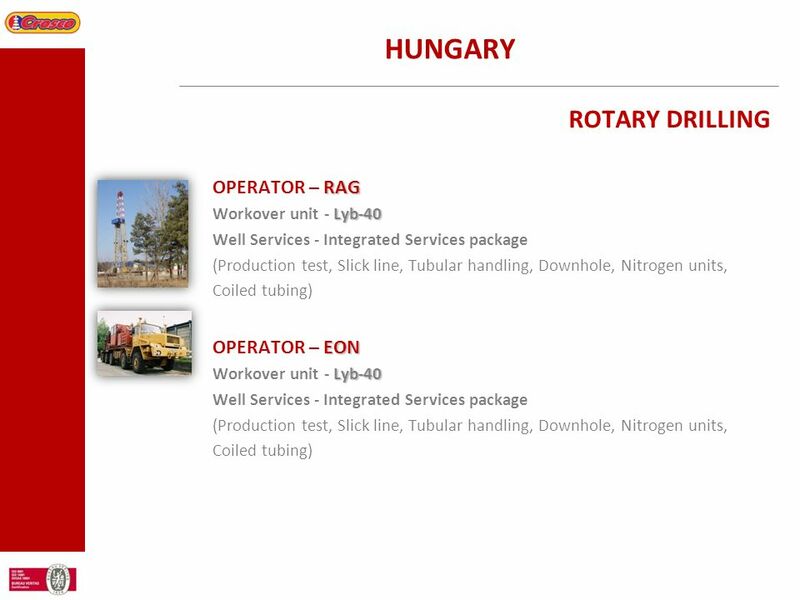 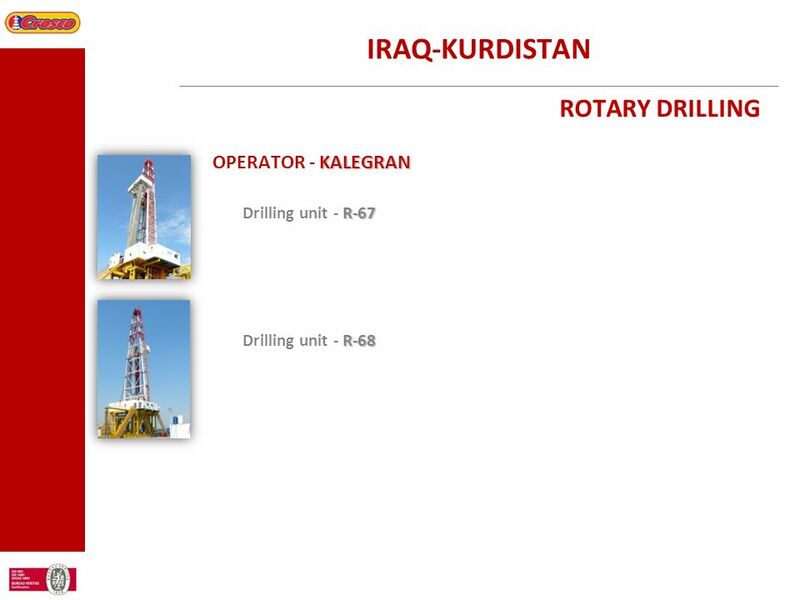 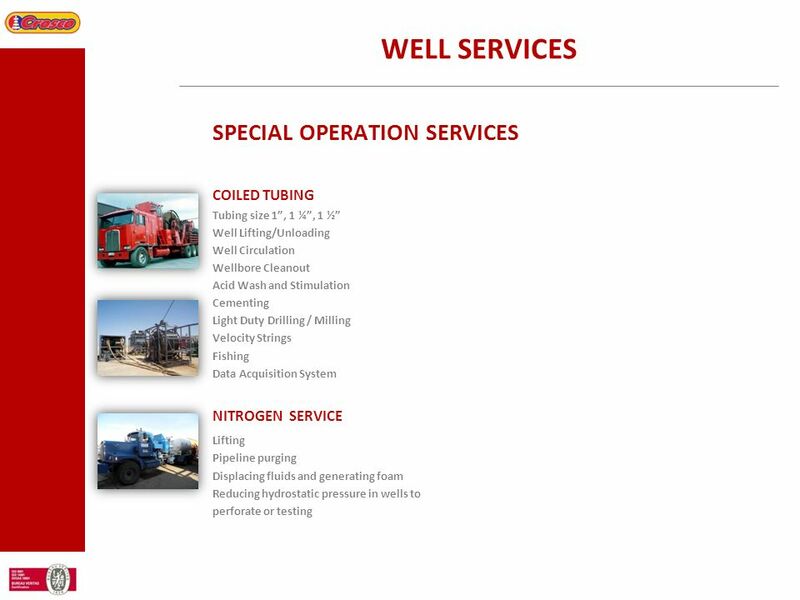 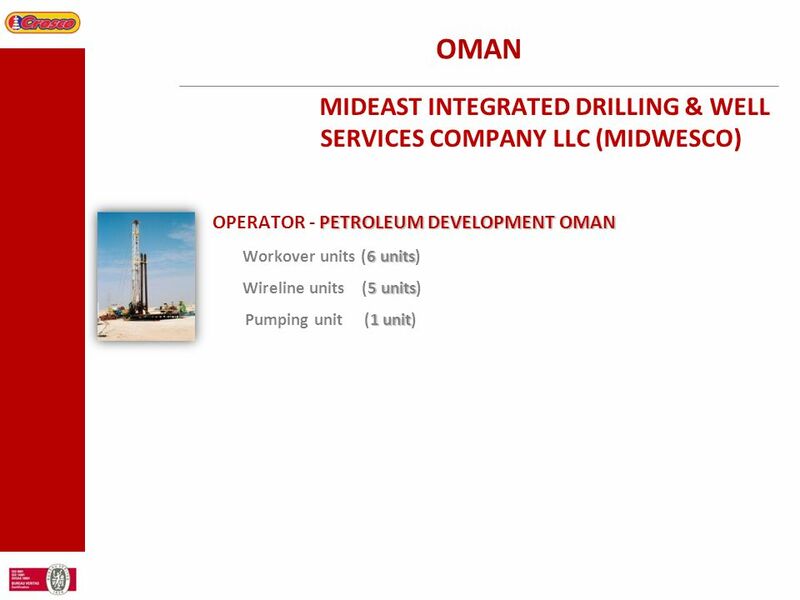 The strategic commitment and objective of CROSCO is to become a globally recognized oilfield service contractor. 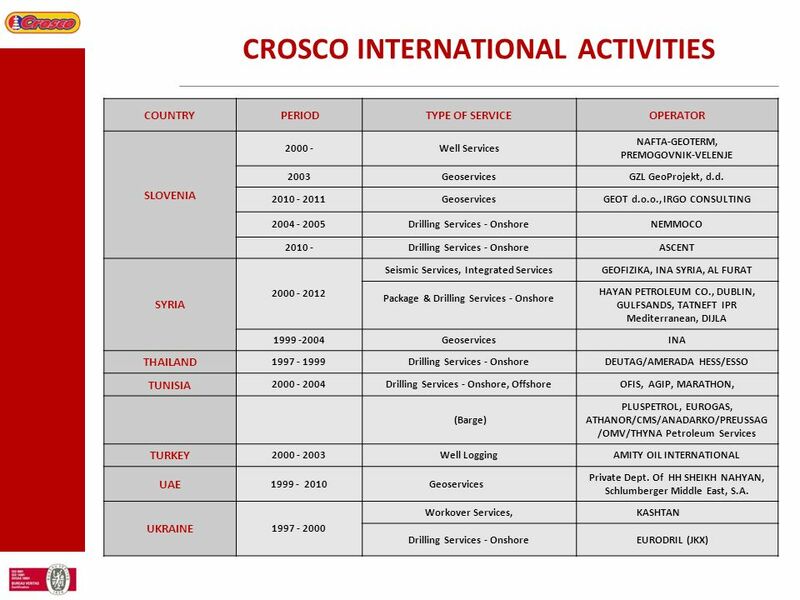 Health and Safety targets are: No occupational illnesses No fatalities LTI free operations CROSCO works on the principle that all injuries should be prevented. 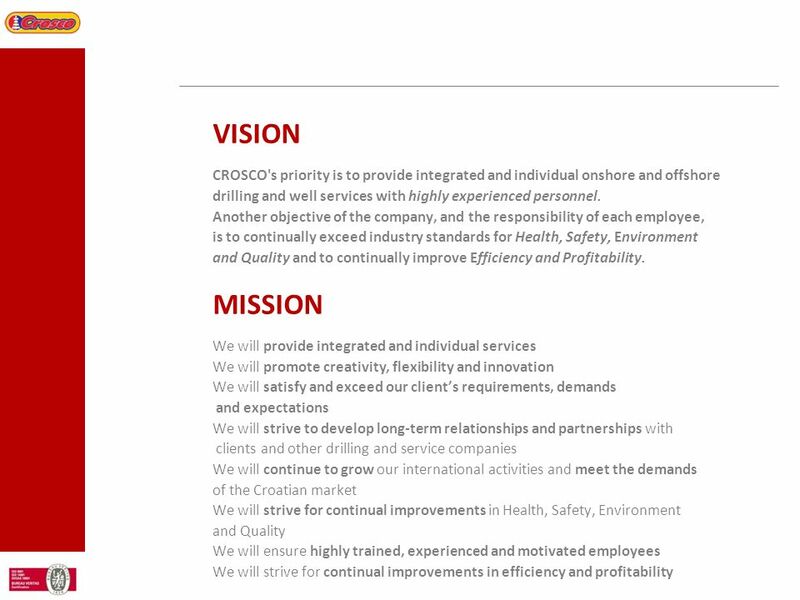 Environmental targets are: No environmental incidents No statutory environmental liabilities Environmentally friendly operations Development of a Contract HSE Plan and Waste Management Plan is CROSCO's standard. 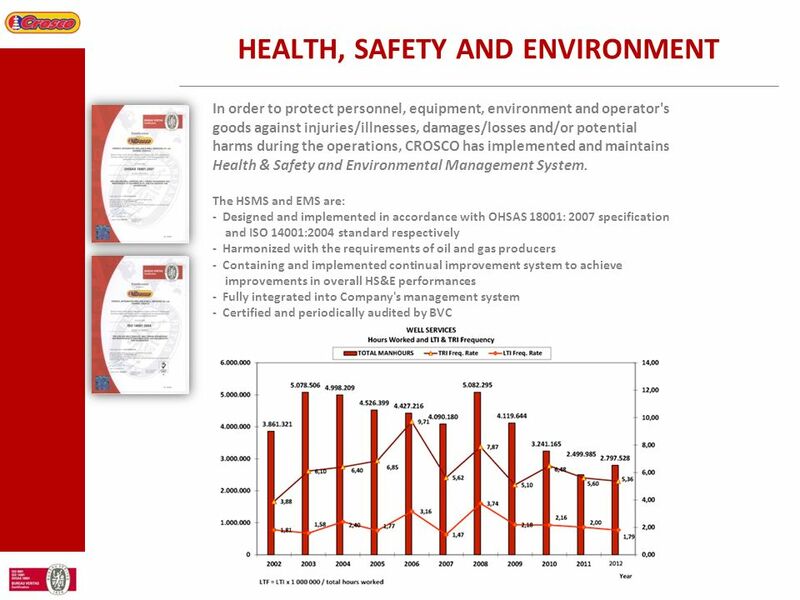 We consider that HSE management is just one aspect of managing the business as a whole. 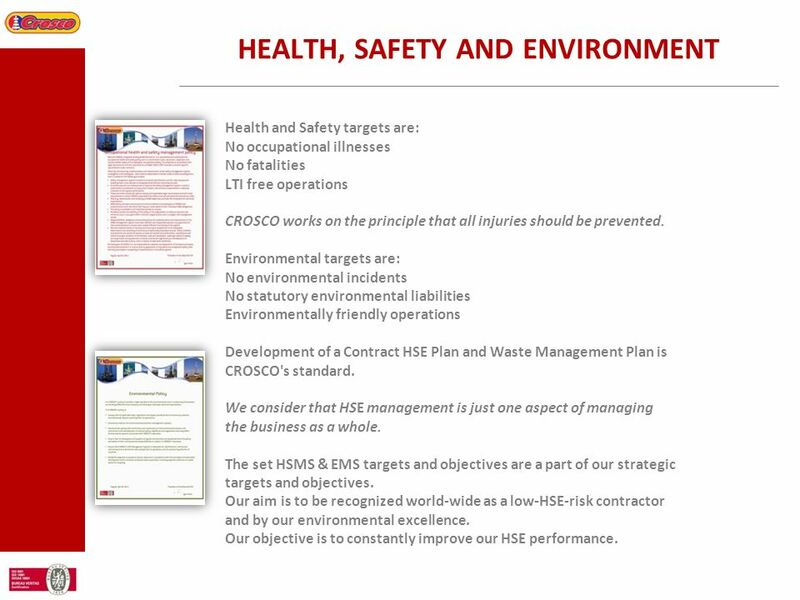 The set HSMS & EMS targets and objectives are a part of our strategic targets and objectives. Our aim is to be recognized world-wide as a low-HSE-risk contractor and by our environmental excellence. 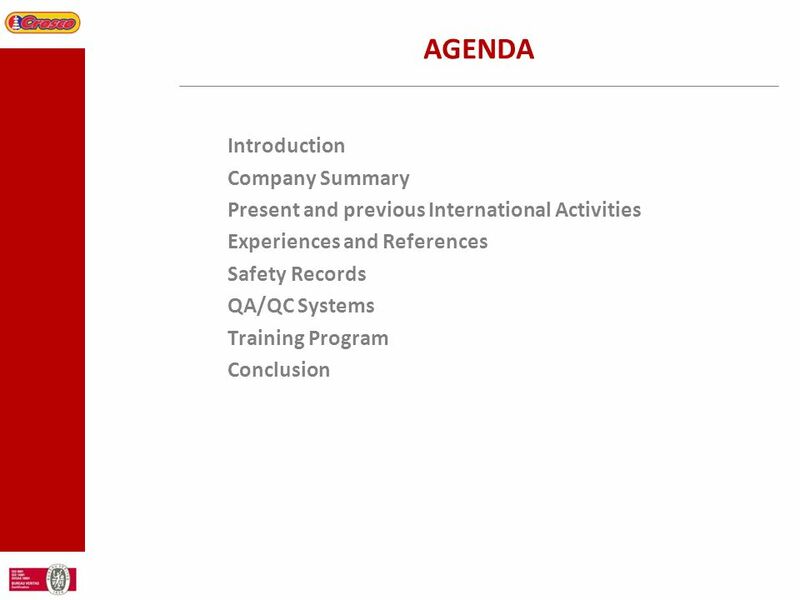 Our objective is to constantly improve our HSE performance. 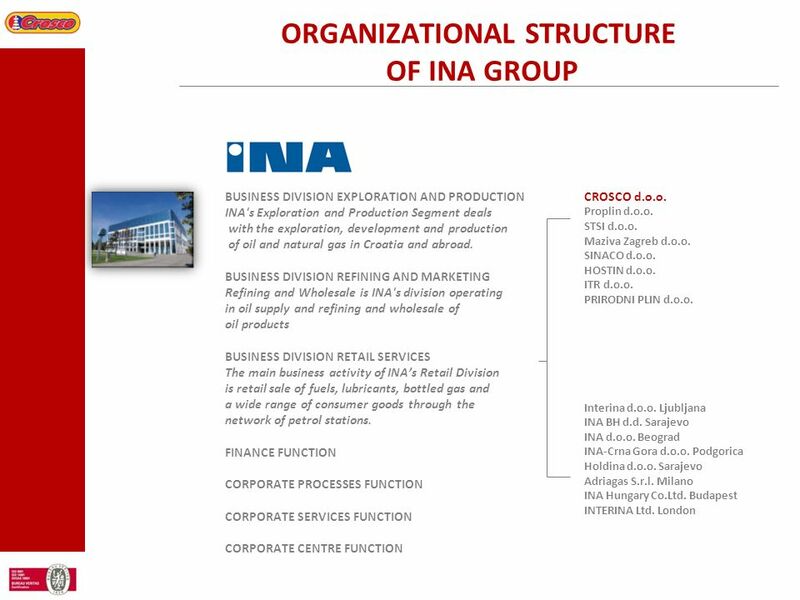 1 OEA Energy Leaders Roundtable: Nuclear Power Panel P. Charlebois Chief Nuclear Officer February 10, 2006 Toronto, Ontario. 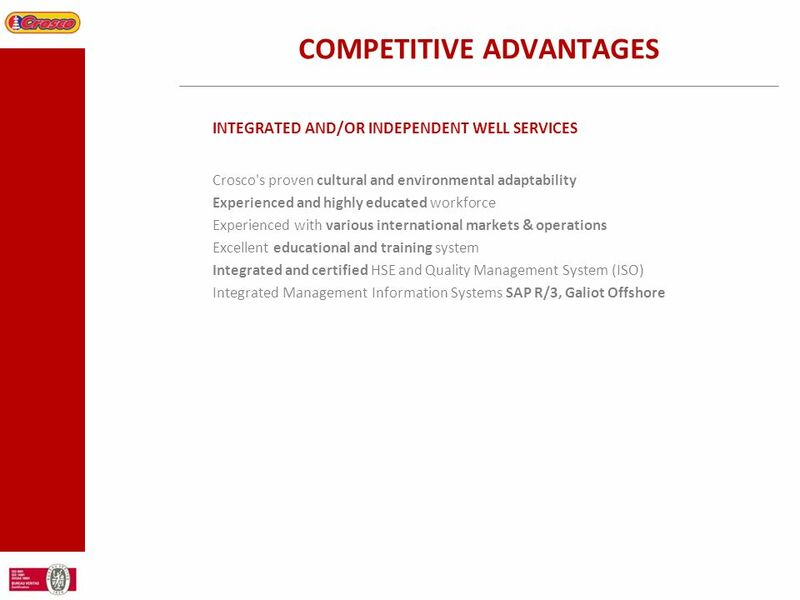 Mechserv Ltd UK / Norway Mentoring Programme 2009 Daryl Craig Business Development & Services Coordinator 03/12/2009. 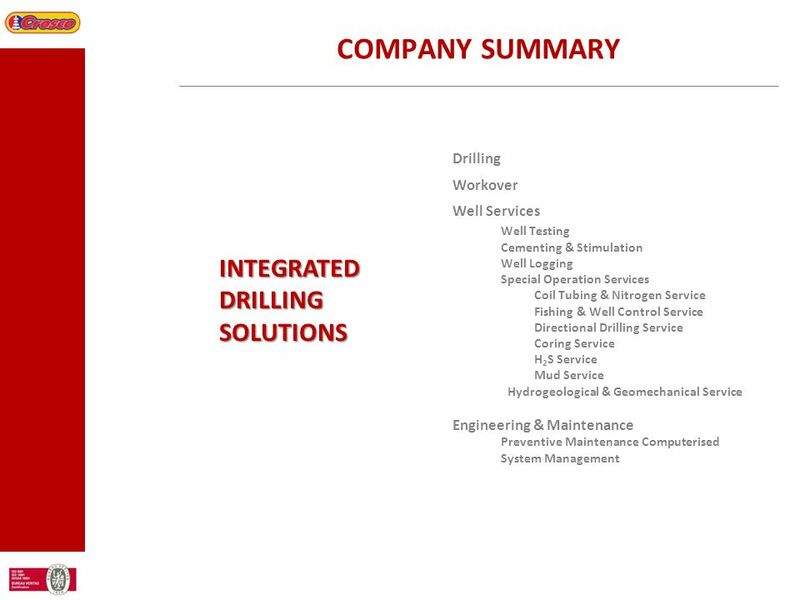 GEOMEC GROUP 2 Geomec Engineering AS offers independent studies, consultancy, training and auditing for oil and gas operators, with an emphasis on compaction. 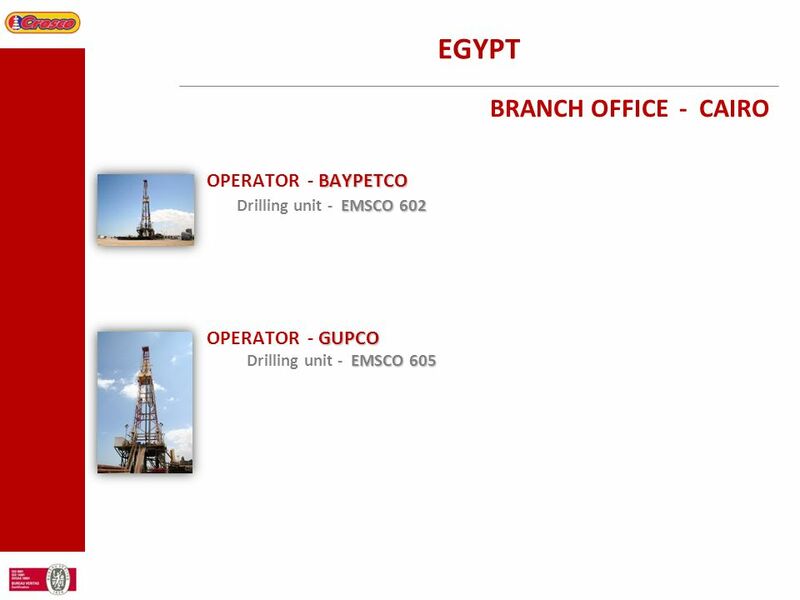 Arabtec Construction Co. Submetted to : Dr Dana Adas By: Moshref Abu Zubedh Mahmoud Abu Alshawareb English in workplace 2010/2011 Arabtec construction. 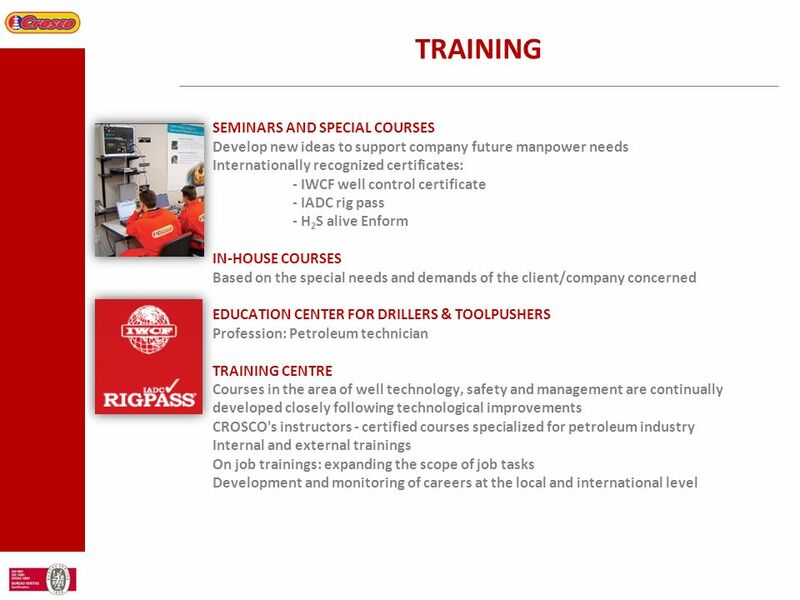 Technical Inspection ServicesTechnical Staffing ServicesManagement System Certification Technical Training.